Enough beads and stretch cord to make 100 bracelets. Or use them to make other jewelry or craft projects. 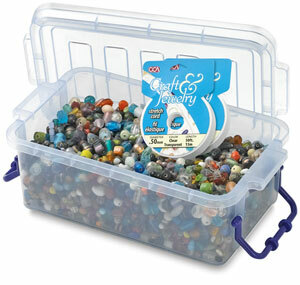 The entire set is housed in a sturdy, see-through, reusable plastic box with locking side handles. Two rolls of 0.50 mm stretch cord and bracelet instructions are included. Glass beads are perfect for camp, classroom, or at-home projects. This dazzling assortment of glittering glass beads comes in colors, shapes, and styles to please everyone!